About The Book Coming from the world's most prominent fitness site Bodybuilding.com, The Bodybuilding.com: Guide To Your Best Body offers a revolutionary 12-week diet and program. This strategy has created thousands of real life success tales and is supported by Hrithik Roshan. in existence since 2009, Bodybuilding.com has over 2 million active members, at least 2 billion page views and up to 44 million member posts in its forums. A typical product of Simon & Schuster, this book has a devoted and massive online following, with savvy online marketing and tremendous retail resources. 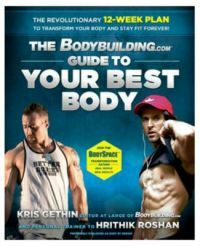 Written by former editor-in-chief of Bodybuilding.com, Kris Gethin, this book is a no-nonsense and practical fitness guide. The Bodybuilding.com: Guide To Your Best Body is not just for the iron-pumping muscleman, but also for the general fitness-enthusiatic audience. If you are an ardent reader of Bill Philips and Tosca Reno, this book is for you. Included in this guide are two primary parts. Part one familiarizes readers with the four pillars of power. These are concise action steps that provide consistent motivation and resolve. Part two incorporates a fitness plan that lasts for 12 weeks, illustrated with photos, workout regimes and tips and tools that boost nutrition. The Bodybuilding.com: Guide To Your Best Body gives you the secret cutting-edge methods of maximising muscle gain, in a comprehensive and detailed manner. This book is available in paperback and was published in 2013. Key Features Includes a 12-week fitness plan, illustrated with photos, workout regimes, tips and other useful tools. This is a practical guide to bodybuilding by the editor-in-chief of Bodybuilding.com. About the Author: Kris Gethin is Welsh bodybuilder from Wales in United Kingdom, who is known for being the first lifetime natural drug-free bodybuilder. He has received a diploma in International Health and Sports Therapy. He has previously written for FLEX, Muscle & Fitness Australia, Iron Man, Muscle Mag, Max Sports, XOXO, Body Fitness and Muscle News among numerous other fitness magazines. His personal publication is caled Kaged Muscle and he works as a massage therapist and personal trainer to many celebrities, including Hritik Roshan of Bollywood.